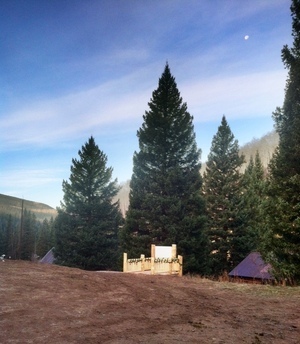 This year's Capitol Christmas tree comes from White River National Forest in Northwest Colorado. The spruce is more than 70 feet tall. The undeniable smell of fresh-cut spruce filled the air Friday morning as crews crowded around the trunk of this year's Capitol Christmas tree, prepping it for departure to Washington, D.C. The task of finding this year's Capitol Christmas tree was left largely up to one man: Scott Fitzwilliams, forest supervisor for the White River National Forest in Colorado. In picking the tree, Fitzwilliams was asked to follow a few guidelines. "It has to be the right size; it can't be too tall, too big," he says. "And what they look for is the fullness. So it looks like a giant version of the Christmas tree you have in your house." As a chainsaw gnawed at the trunk of the tree Friday, sawdust piled up on the forest floor. 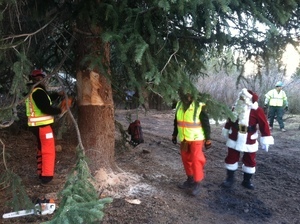 The workers prevented the tree from falling over to protect the boughs. When the chainsaw stopped, they lowered a crane into position. As they got ready to hoist the spruce over a small cabin and place it onto a flatbed truck, a man in a fluorescent vest climbed the tree, trying to get a sling around it to lift it up. Crews cut down the national Christmas tree, carefully. To prevent it from falling over, they put a sling around it and hoisted it onto a flatbed truck. The crowd, mostly from the nearby town of Meeker, was electric. When the tree began to rise, cameras captured the moment. The crane gently lowered the tree onto the truck that will take it across the country. The chosen tree, a towering 70-foot-tall dark green spruce, has started its journey. Along the way to the nation's capital, it will stop in 10 states. The tradition began in the 1970s. The federal government chooses a particular national forest, and then the forest supervisor picks a few candidate trees. The final selection is then cut down and hauled to D.C. Nearby resident Gerald Morris is one of the drivers this year. When he found out the tree was coming from the White River National Forest, he decided to put his commercial drivers license to use. "It's a great thing to be involved in such a project. And everybody gets to see something they'll probably never see again," he says. The tree's scheduled to be lit the first week of December.